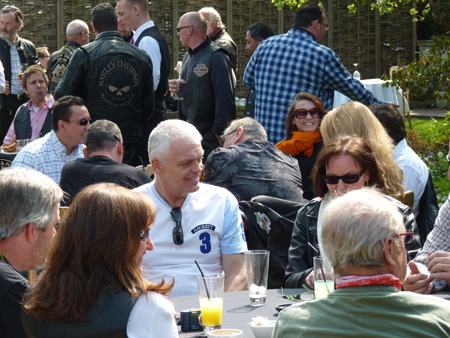 It never rains on Scottie’s rides, so we were assured of a good turnout and a fantastic day. So why Canterbury Tales, since we went to Oxfordshire? This should have been explained at the briefing but we simply ran out of time, the large number of welcome new faces required that we emphasised some basics such as the drop-off system at the expense of the detail. The Canterbury Tales, written by Chaucer in the 1370s, consists of the tales supposedly told by Christian pilgrims to pass the time on their journey between Southwark and Kent. One of the tellers is a cleric from Oxford, a man in holy orders who is a keen scholar but practically penniless, riding a skinny old horse, and who would rather spend his money on books than booze. Much of the landscape in the Thames Valley area has barely changed since Chaucer’s time. Hence our ride-out retraced the steps of the Oxford Cleric on his way into London to meet the other pilgrims (apart from the M4, which is undoubtedly more modern than most of the roads we used). The destination was a pub we have used before, the Crazy Bear at Stadhampton, with a freshly and deeply gravelled car park. Between 611 Kings Road and Stadhampton was a fantastic variety of roads, literally everything from 4-lane motorway to technical single track with gravel. And several thousand cyclists, none of whom were present on several recces in the weeks before. After a full briefing, we set off up the M4, over the elevated section and up past Heathrow airport - due to the last minute addition of a car-boot sale we had to change the route on the morning of the run, so we stayed on the M4 to Junction 8, after which it was pretty much cross country all the way. Some of the road surfaces seemed to date back to 14th Century, but all were negotiated without difficulty. 60 enjoyable miles passed all too soon, then it was a feast under the trees at the pub before making one’s individual way homewards. Thanks to Scottie and Nick for leading and marshalling, and John Warr as ever for providing coffee and breakfast.